There’s all kinds of ways to isolate and work out just the muscle groups you want. 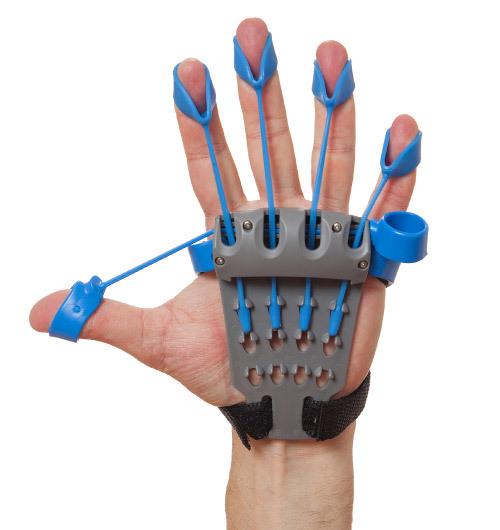 Over the years, we’ve seen them all, but it’s the first time we realize a neglected exercise: the hand extensors. You’re likely familiar with those Hand Grip Strengtheners, which rely on you squeezing to develop the muscles of the forearms. But the opposite of squeezing, extending your fingers, seems to go largely ignored. 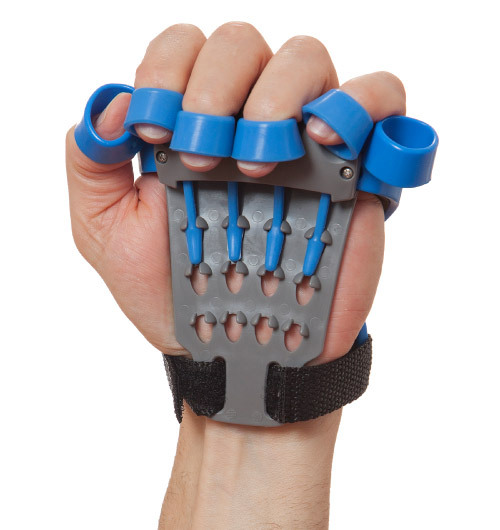 That’s what the Xtensor Hand Exerciser is all about. Insert fingertips in rubber rings, and gain some strength with the resistance provided. We can’t really tell you why you would want to develop that particular set of muscles, aside from maybe being better at flinging stuff off your finger tips. Or maybe relieving ostheo-arthritis symptoms, as the makers suggest. It’s $30. So you’re working up a sweat… when you suddenly remember you have to make a call or pay a workout buddy that five bucks you owed him from last week. Stopping your workout to get stuff from your locker can be a pain because it throws your momentum off. 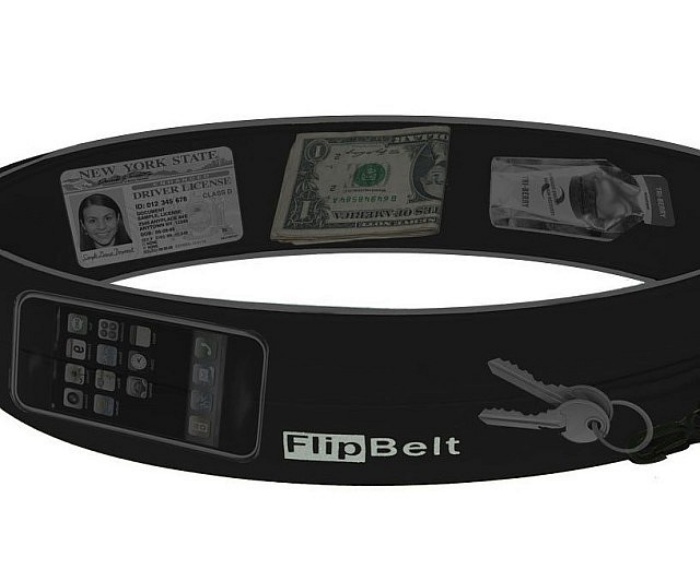 If you’d rather have you stuff on you and don’t mind the extra weight, then you might want to check out the Flip Belt. It’s a storage belt made specially for exercisers so you can stash your essentials (like your keys, phone, some cash, your credit cards) and non-essentials (like your iPod, comb, some mint) and carry them with you while you work out. By David Ponce on 07/16/14 • Leave a comment! 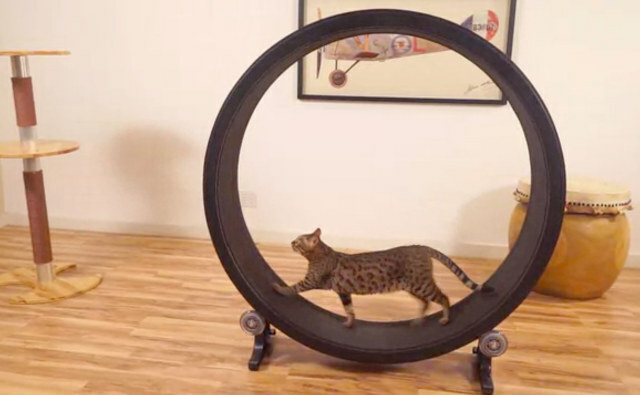 This is an exercise wheel for cats, and it’s called One Fast Cat. It’s $200. Like any moderately expensive things you buy for your cats, they’re going to sniff it twice and go sit in an empty cardboard box instead. So you might want to think twice before you jump aboard. The cat in the video is actually a Bengal cat, who are somewhat more wild versions of cats and tend to want to exercise considerably more than a regular house cat. Some features to note are that it’s made from recycled plastics and its “surface is made from a closed cell EVA foam to prevent claws from catching and allowing cats to run naturally using their claws for safe footing.” It’s easy to wash and comes in a small box for you to assemble at home. The Kickstarter is fully funded, so that pledge should net you a giant paperweight feline exercise wheel by September of this year. Over the years, people have come up with all sorts of concepts and prototypes that can charge up your phone or mobile device without needing electricity. For example, take the onE Puck, which uses the heat from your cup of coffee to power up your device. Then there’s SolePower, which is a removable insole that generates energy in order to charge your phone, MP3 player, or tablet as you walk. In the same category as these is the PULSE kinetic jump rope, which generated power for your device’s batteries with every jump that you make. It looks like a typical jump rope, except for the fact that its got a pair of dynamos built into the handles. These, in turn, are connected to a rechargeable battery, where the generated energy is stored. PULSE is available in a limited beta test run at $129. Only 100 will be made available. Work can be such a pain. The same goes for exercise. 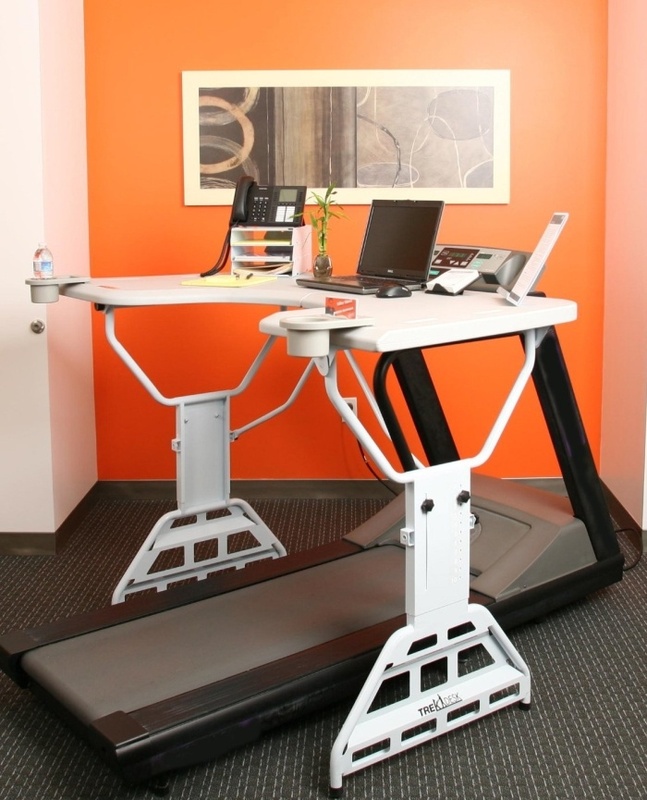 Why someone would want to assemble a contraption that would allow people to do both things simultaneously is beyond me, but maybe there’s a demand for it because the treadmill desk exists. It’s called the TrekDesk and it’s a desk that can be attached to a treadmill so you can walk, job, or run at your desired pace while typing reports, crunching numbers, or doing whatever else you need to do on the desk. The TrekDesk can be attached to virtually any treadmill and comes with a manuscript holder, a three-level file folder, two cup holders, and a headset stand. That way, there’s a space for most of your stuff so your work area won’t be so cluttered. The desk lets you work hard while you work out, although you probably shouldn’t sign anything while you’re on it because you’ll probably mess your signature up. The TrekDesk retails for $479. Kuwaete Sukkiri Tongue Exerciser Gets Rid of Sagging Cheeks? Yeah, Right! By Hazel Chua on 12/20/12 • Leave a comment! Do you exercise your tongue? Before you answer ‘no’, you might want to reconsider if you’ve ever French-kissed with someone. Aside from that, I can only think of a handful of other things that people can do to exercise their tongues, although I doubt they do these things explicitly for that reason. As you might already know, the tongue is the strongest muscle in the human body. Not that it really needs it–but if you want to, then you can actually exercise it with the Kuwaete Sukkiri Tongue Exerciser. What better time than after the Holidays’ debauchery to talk about a cool new application that just might help get you back into a gym? Gym-Pact works like this: 1) You commit to go to the gym a certain number of times per week. 2) You also agree to put a certain amount of money at stake for each day you miss. 3) You get paid if you keep your goals with the money from those who didn’t! The amount of money you get isn’t set and depends on how much was collected from people who defaulted on their commitments on any given week. Your share gets bigger with a higher number of days at the gym, but not with the amounts you put at stake (these are for your personal motivation). Gym-Pact skims 3% off the top. You shouldn’t expect to get rich off this as 90% of users in an initial trial kept their goals, but even small amounts from 10% of users can add up over time. There is an iPhone app with a check-in feature and 40,000 gyms in the database. If yours isn’t there, you can add it, though it has to be an actual fitness center and not a home or office gym. You also can’t just drop by the gym, check in and walk away; the app checks your location at regular intervals to make sure you stick around. And it appears to be a US only service at the moment, though we’ve contacted them to see if they have plans for expansion. No word yet. The app is free and available now. Apparently just lifting dumbbells isn’t good enough any more. 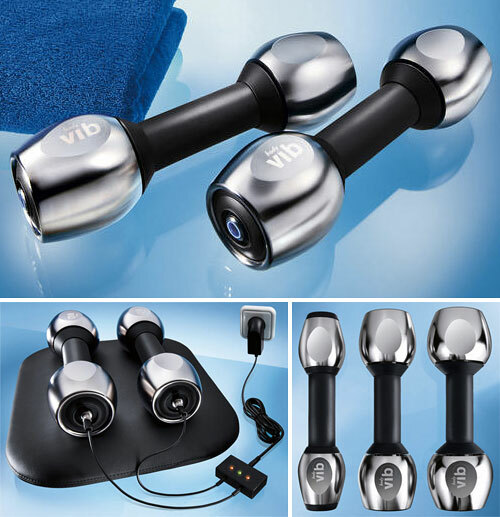 Like those crazy exercise belt-driven fitness contraptions of yesteryear, these BodyVib weights actually vibrate at 36Hz (or 2,160 vibrations/min) with an amplitude of 1.2mm, which is apparently more than enough to ‘intensify’ your training by up to 50%. The idea behind the vibrations is that it causes the muscles in your hands and arms to quickly contract and relax in response, burning more energy in a shorter period of time, and resulting in a longer afterburn time. After a 30 to 50 minute charge (yep, it’s one more thing vying for power bar access) the dumbbells will vibrate for up to 2 1/2 hours. And to prolong the battery life they use a sensor to only start the vibration motor once you grab the handle. If it works as they claim I don’t see why everyone shouldn’t upgrade to vibrating weights… except for the price. Available in 3.3, 6 and 10 pound pairs, the BodyVib dumbbells sell for a whopping ~$1,060 (£649) to ~$1,190 (£729) on Pro-Idee.